While turnips do not enjoy large popularity among U.S. gardeners, these root vegetables have a long and steady history in European gardens. 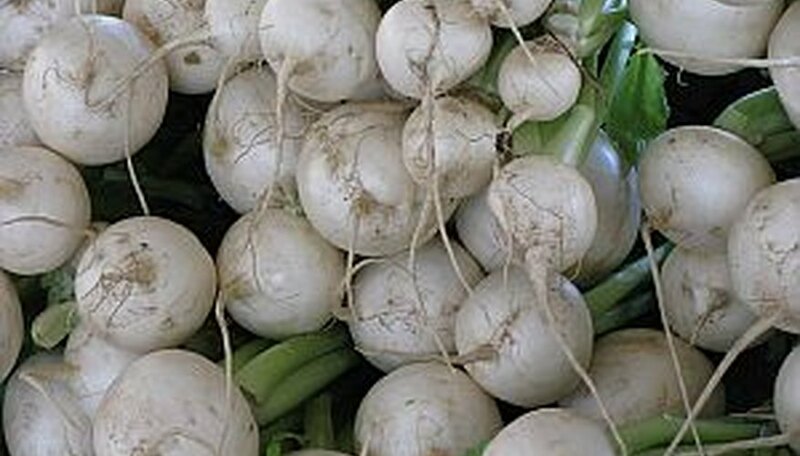 Turnips are a spring-sown vegetable that mature within two months of planting. Gardeners grow turnips for both their delicious greens and tasty roots. Harvest turnip greens when they are large enough to use and harvest turnip roots when they are of medium size. Store both foods for future use. Tend the turnips carefully over the course of the growing season to ensure a bountiful harvest. Make sure the turnips receive at least 1 inch of water each week. For best results, water once per week deeply instead of lighter, more frequent watering. Lay down a 2-inch layer of mulch around the base of the plants to insulate the roots from heat and control weeds. Harvest some turnips very early for both the greens and the tiny roots that are ideal for eating raw. When the turnip leaves are between 4 and 6 inches long, carefully loosen the soil around the turnip root and remove it from the ground. Cut the greens from the roots immediately to prevent the roots from shriveling. Wait to harvest turnips for the roots until they are between 2 and 3 inches wide. Harvest all turnips before the soil freezes in the autumn. Loosen the soil around the turnip and dig it up from the soil. Cut the greens from the roots immediately to prevent the roots from shriveling. Store turnip unwashed turnip greens by wrapping them in moistened paper towels and placing them into a sealed plastic bag. Place the bag into the vegetable drawer in the refrigerator and use within 1-2 days. Store unwashed turnips in plastic bags in the refrigerator and use within two weeks. Store turnip chunks in the freezer by blanching them for three minutes, placing into cool water for one minute and freezing in sealed plastic bags. Store whole turnips in a box filled with damp sand. Cover the box and place it in a cool, dry place for up to 5 months. What Vegetables Grow in Subsoil?